Is your plant in need of more space? 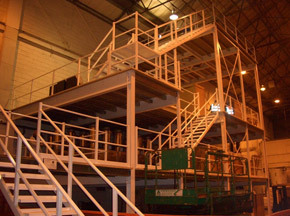 We are able to install bespoke plant mezzanine floors, both internally and externally for a wide range of equipment including mechanical and electrical systems. 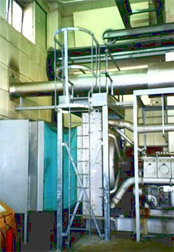 HMF will design your new mezzanine floor to accommodate specific point loads for your machinery or installed equipment. This is a great option if you’re looking to make the most of your current plant space. Depending on whether your floor is external or internal, we have a range of finishes including hot-dipped, galvanised and painted. Plant mezzanine flooring is usually durbar chequer plate steel, open mesh or P6 grade tongue and grooved mezzanine floor decking. You have the choice to access your mezzanine floor via either a staircase or cat ladder. Loading gates can also be incorporated within the perimeter barrier system to enable placement of plant and machinery. The perimeter handrail is constructed from box section double tubular rail and is available in a wide range of colours. Kickboard is fitted to most perimeter applications below the handrail. If you’re interested in exploring options for a new plant mezzanine floor, get in contact today. You can give us a call, or request a quote. Hampshire Mezzanine Floor provides a fully supportive service, from start to finish. We will help you to get the most out of your current space at a reasonable cost. We provide only the highest quality finish, thanks to the skilled trade persons that we work with to complete the job.